I love Eli Siegel for showing that the study of poetry is a beautiful and urgent necessity for our lives. He showed how, from the poetry of ancient China to that of 20th century America, from the Old Testament and the sonnets of Shakespeare, to the work of Robert Burns and Walt Whitman—every true poem is fair to the world, honest about it, in a way we want and need to be. we have to have the universal or general—that which is as common as air or even more common—and then there needs to be a point. Poetry gives evidence that goodness is the oneness of distinction and universality. It must have sauce and divinity, point and generality. These are opposites Mr. Siegel showed Rossetti’s poetry has in a distinctive way—he saw large, universal meaning in what was pulsatingly close to him, from ordinary objects to the body of a woman he loved. For example, he says in the sonnet “Heart’s Compass,” which we heard later: “Sometimes thou seem’st not as thyself alone, / But as the meaning of all things that are.” This feeling, which is throughout Rossetti’s work, made, Mr. Siegel explained, for a new daring in English poetry. we meet the distinguished and the universal. Rossetti has given a new possibility to sense; sense is very much present—but it keeps company with meaning. He saw the senses in relation to meaning in a different way than they had been seen before. 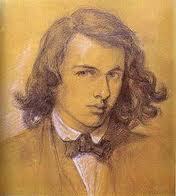 They sure have a time of it in Rossetti’s poetry. He continued, “In all poetry, something of sense is related to something else in such a way that meaning or value takes place. This can be done through music.” Eli Siegel has explained that poetic music, which is the sign of a poem’s sincerity, comes from a person’s showing, in the way he uses words, how a specific thing embodies the world’s structure: the oneness of opposites. When one hears church bells and the sound stops, what is the verb for that? left off? ceased? sank? But if there is evil going on, you can say [as Rossetti does] ‘crept off,’ because you could have the sounds themselves ashamed. Rossetti is doing that. He wanted to personify everything, including time. Some heavenly solstice hushed and halcyon. Studying this sonnet and what Eli Siegel showed it is about has me see more about a big mistake many people, including myself, have made. In going after what I thought was the pleasure of love, I didn’t see a man as standing for what Rossetti calls “the meaning of all things that are.” And I am so grateful that in a recent class, speaking about the difference between the customary notion of love, and the idea of love Rossetti represents, Ellen Reiss said to me: “Either we’re going to feel that what is before us is something we love because we can own and manage it, or because it’s not in our control and that’s why we love it.” I am proud and grateful to be learning from Aesthetic Realism and from Ellen Reiss what love is, and feel, as I think about my husband, Alan Shapiro, that who he is is his relation to the whole world, in its variety and its mystery—which I want to know and be fair to. Every poem that was ever written, everything written by a person with a poetic purpose says, This thing is true, and it matters. Rossetti is saying: the world can be seen in this way, and it matters. ‘crackling water’—that’s surrealist; or ‘stiff humidity.’ That’s the important thing: how something can be what it contradicts.…This is more evidence that there was a certain daring that Rossetti had…and it wasn’t had by the others. Rossetti is saying, What other people get from attending church, I should get from this person. It can be seen as figurative language, but in Rossetti’s instance, I don’t think it is—that’s what is important. He saw it as actually so. Eli Siegel’s magnificent showing of the value of Dante Gabriel Rossetti—his grandly musical poetry—is a high point in cultural history, and it is a high point in my life to have heard it. The fact that Aesthetic Realism shows we can learn from poetry how to see the whole world and every specific thing and person is the greatest news I know.